Questions? Call Us 1–773–271–0318 9am to 2pm Central Time Mon.–Fri. 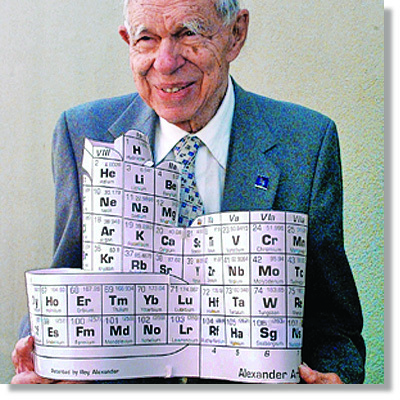 Dr.Glenn T.Seaborg in 1997, with the Alexander Arrangement of Elements, which he referred to as his "favorite" periodic table. 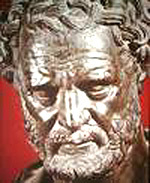 ...that was known early-on by people, of course, but Greek thinkers Anaxagoras, Leucippus, and then Democritus, about 400 BCE, used a word which would become our "element" for different substances, and "atom" for their smallest parts. These have survived, while ’elements’ of Earth, Water, Air, Fire, and Ether to explain ’world stuff’, Aristotle’s concepts, misled Europeans into alchemy in the Middle Ages, mainly trying to make gold from lesser matter. 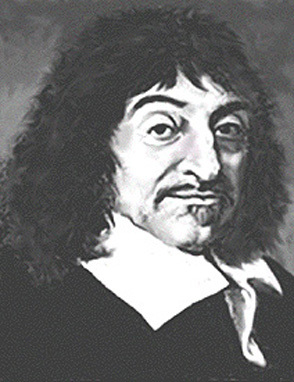 Aristotle was rejected by Descartes, emphasizing more orderly methods of investigating nature. Experimental research then led Boyle in the mid 1600s also to separate from Aristotle. 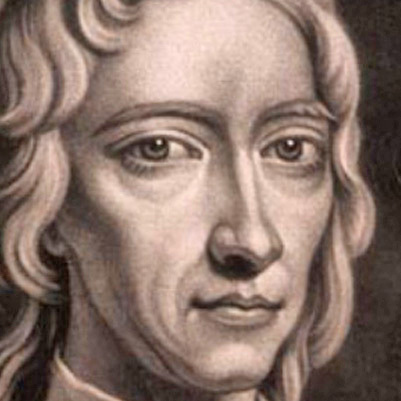 He measured the weight gain of heated metals, as well as helping start the Royal Society to further accuracy of observation in science - although he practiced alchemy himself. The affinity table - Diderot’s shown here - sparked the chemical revolution (1718-1869), which revived Leucippus’ atomic theory in transition from mystical alchemy to a period of a huge amount of theoretical chemistry and experimentation. Lavoisier, who became known as the "Father of Modern Chemistry", developed the first extensive element list, of 33, separating metals from non-metals, dividing the few elements known in the 1700’s into four classes, and discovering Oxygen and Hydrogen. 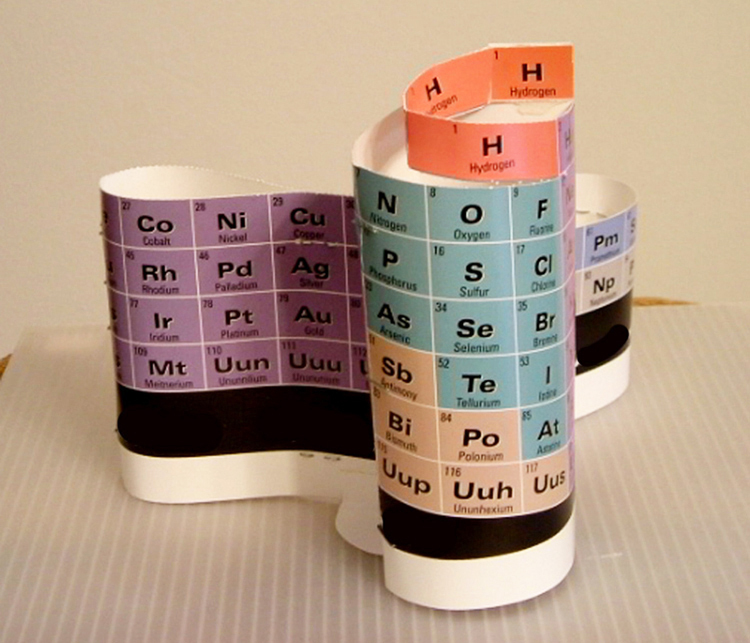 Attempts to organize elements were based on chemical and physical properties that could be observed in the 1800s. 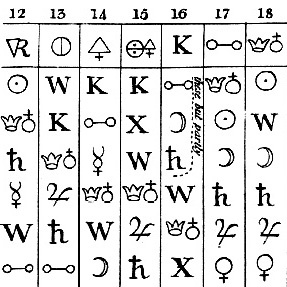 In the 1820’s Berzelius’ weight based table introduced letters to identify elements, rather than the symbols used earlier. Dobereiner found that some sets of three elements could be grouped - later called ’Triads’ in 1829. Then Dalton, using Democritus’ ’atomos’ and developing an improved method of determining their weights created the first chart by weight. He also determined the differences between elements alone and compounds - a distinction further detailed by Avogadro 20 years later: that volumes of gas at the same pressure and temperature have equal numbers of molecules or atoms. Cannizaro, applying Avogadro's law years later, produced more accurate atomic weights for the elements known in the 1860s, and announced them at the first major science convention, the Karlsruhe Congress. 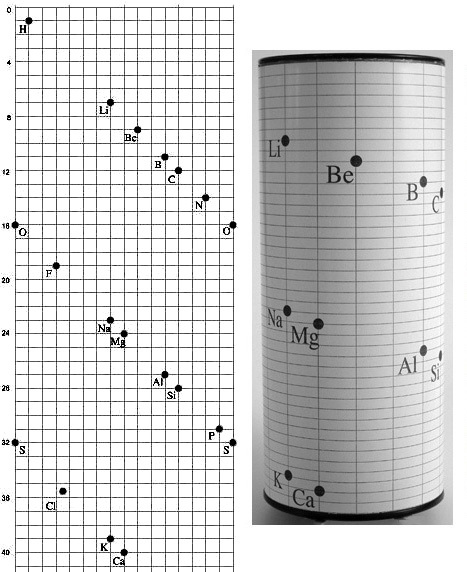 Likely basing element sequencing by these weights, de Chancourtois, a geologist, created a fully-functioning periodic system on a cylinder, which he called the vis Tellurique, the first to portray the periodicity of properties that defines the modern table. 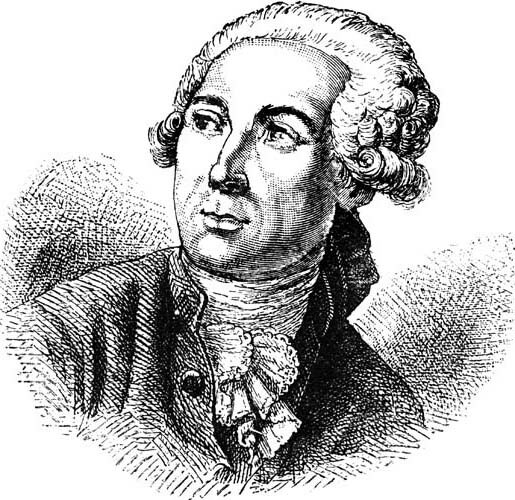 Organizing the elements in three dimensions was a natural solution for him, as his work included correcting the relationships between world globes, maps, and sub-surfaces. It allowed him to convey elements’ common properties vertically while maintaining them all in unbroken order of increasing weight of their atoms - a decade prior to the flat table of Mendeleev, who usually gets the credit for the invention of the periodic table. 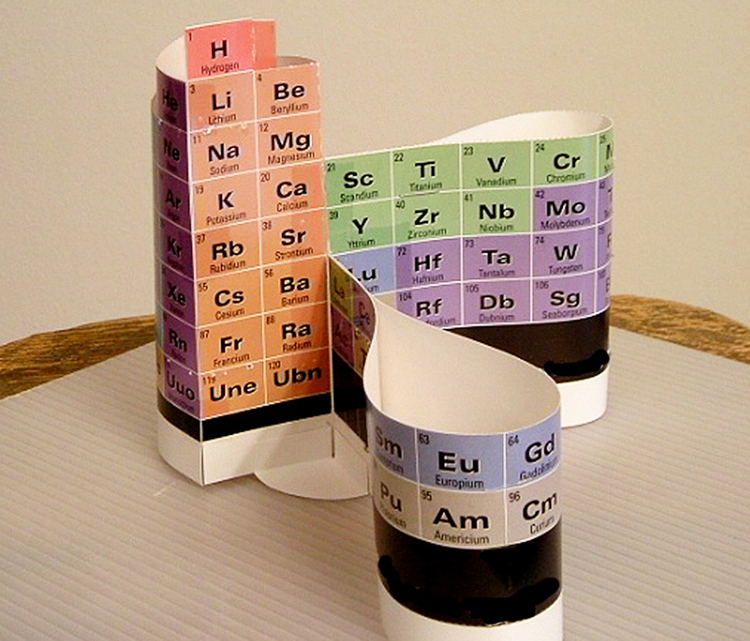 The first true periodic table was 3D. 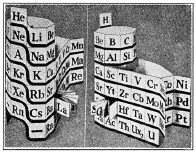 De Chancourtois’ vis Tellurique paper, describing his 3D periodic table, was published by the French Academy of Sciences in 1862, but without the visual he had submitted, was poorly understood, and was little noticed for 11 years, but was re–introduced after Mendeleev’s periodic table attracted attention among chemists. Then elements were arranged by Newlands and given a number sequence in order of their atomic weights, beginning with Hydrogen. 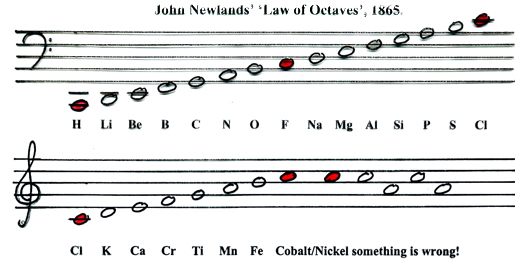 This showed "The eighth element, starting from a given one, is a kind of repetition of the first", which Newlands called the Law of Octaves. While correct, his connecting it to music led to ridicule and dismissal of the idea by scientists. 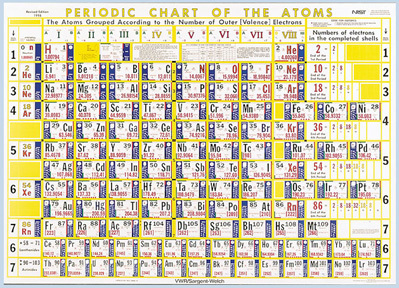 In 1869, Meyer compiled a Periodic Table of 56 elements based on the periodicity of properties such as molar volume. 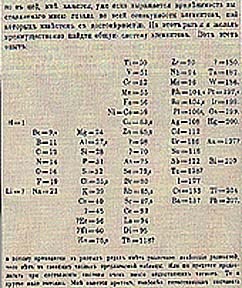 Both Meyer and Mendeleev constructed periodic tables independently that are credited as being the basis of the modern table. Meyer was more impressed by the periodicity of physical properties, while Mendeleev was more interested in the chemical properties. 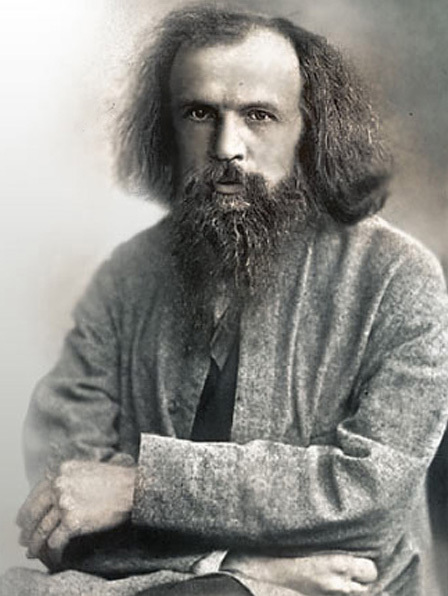 Mendeleev also published his periodic table & Law in 1869, but he also forecast the properties of missing elements, and chemists began to appreciate it when, soon after, the discovery of elements predicted by gaps in his table took place. 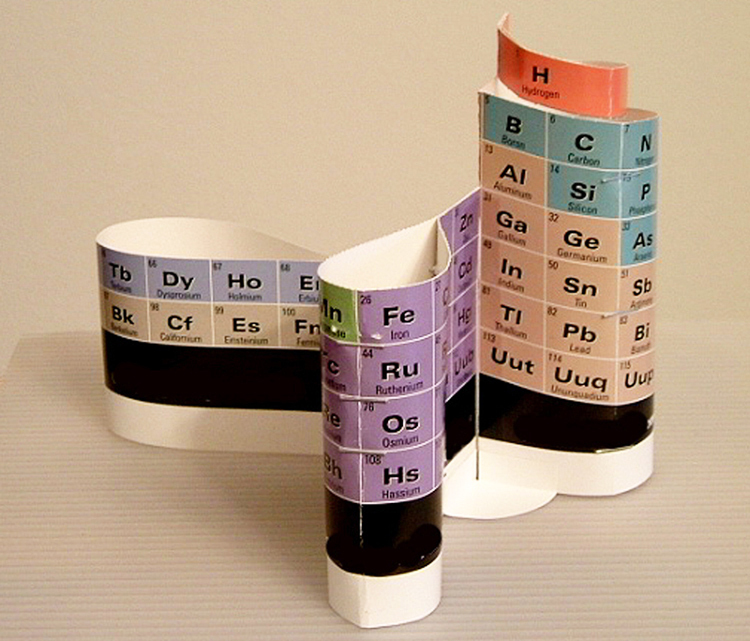 Mendeleev is almost universally thought of as the sole originator of the periodic table. The periodic table appears to have been independently formulated by at least six people within one decade: de Chancourtois, Newlands, Meyer, and Mendeleev, as well as Hinrichs, and Odling. In 1894 Ramsay isolated argon, and in the next year discovered helium. He went on to discover neon, krypton and xenon, and added a group to the periodic table to be called the Noble Gases - elements least likely to combine with others. Later, the table was scientifically reordered by Mosely according to atomic numbers (nuclear charge, using X-Ray) rather than by weight, thereby modifying the Periodic Law. 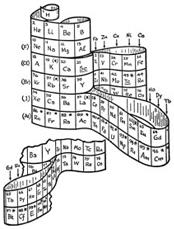 The refreshed Periodic Law revealed important analogies among the 94 naturally occurring elements, and stimulated renewed interest in Inorganic Chemistry in the nineteenth century which has carried into the present with the creation of artificially produced, short lived elements of `atom smashers' and supercolliders of high energy physics. Into the 1930s the heaviest elements were being put up in the body of the periodic table, and Seaborg "plucked those out" while working with Fermi in Chicago, naming them the Actinide series while making many new ones, which later permitted proper placement of subsequently 'created' elements - the Transactinides, changing the periodic table yet again. These elements were placed separate from the main body of the table. 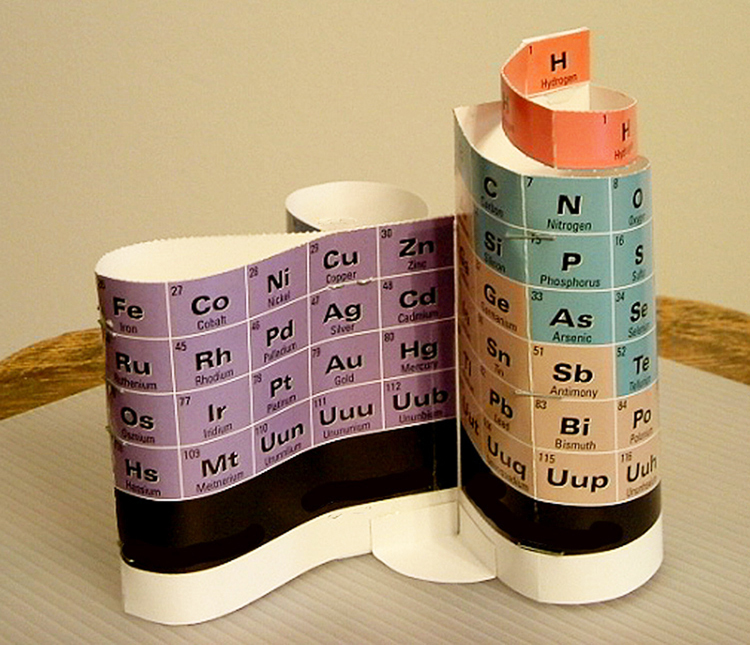 Several scientists - and me, a science exhibit designer - have revived the de Chancourtois 3D periodic table concept for a new 20th Century paradigm. Some have started with a ribbon of elements in atomic number sequence and wrapped it in a spiral to vertically align elements with similar properties, which establishes the ‘periodic’ nature of the table. Others may have merely wrapped the plane of the flat table – after ramping the element rows – escalator–like – in the p–block – and let both the d- and f- element blocks loop, retaining the unbroken atomic number sequence above. Some may have been seeking to resolve technical questions, and others, like Courtines, Gamov and Alexander, aiming for a better educational tool. When Seaborg was shown the 1965 Alexander Arrangement in 1997, he said that it was ’correct’, and later told a photographer that it was his ’favorite’ periodic table. The periodic table has been improved continuously over the last century and a half, built on the shoulders of many creative scientists. The newer versions improve the educational possibilities, easing both use & amplifying of the immense predictive and correlative power of the periodic chart in teaching, learning, and working in chemistry. Section of Diderot's Affinity Table"
René Descartes, "Father of Modern Philosophy"
Antoine Lavoisier, "Father of Modern Chemistry"
Hubbard’s "Chart of the Atoms"